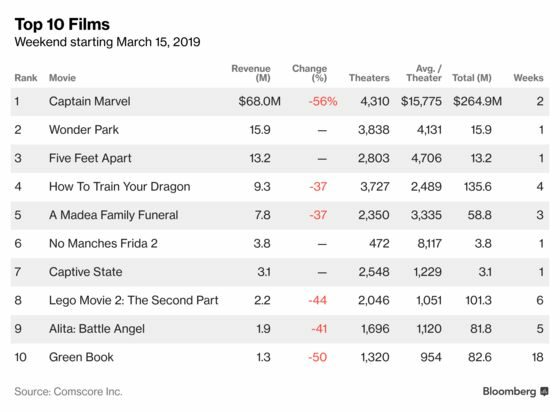 (Bloomberg) -- Walt Disney Co.’s “Captain Marvel” kept its superhero grip on moviegoers, leading the North American box office for a second weekend and outdrawing new releases from Viacom Inc.’s Paramount Pictures and Lions Gate Entertainment Corp. The first-ever female-led superhero picture from Marvel collected $68 million in weekend sales at U.S. and Canadian theaters, researcher Comscore Inc. said Monday. That compared with Box Office Pro’s forecast of $71.5 million. Paramount’s animated “Wonder Park” brought in $15.9 million, while “Five Feet Apart,” from Lions Gate and CBS Corp., generated $13.2 million. The films captured the top three spots. 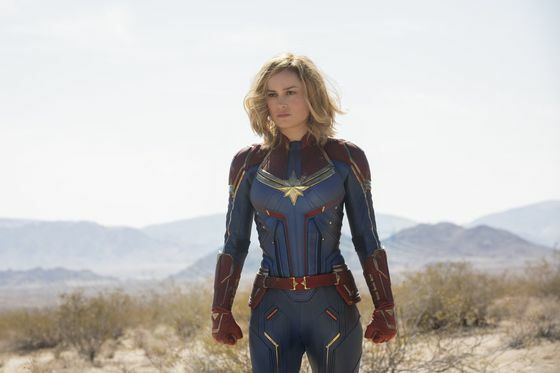 Theater owners are digging out of a hole after a slow start to the year, and new wide releases can help that effort even if they’re not megahits like “Captain Marvel.” Sales for the weekend’s top 10 films totaled $126.4 million, up 6.4 percent from a year earlier. Potential big hits on the horizon this month include “Us” from Universal and “Dumbo” from Disney. “Wonder Park” follows a little girl whose imagination creates a magical theme park in the woods. It got low ratings from reviewers, with a recommendation from just 29 percent of critics, according to Rotten Tomatoes. Box Office Pro predicted weekend sales of $12 million. “Five Feet Apart” tells the story of two teenagers with life-threatening illnesses who meet in a hospital and fall in love. More critics liked the movie, with 52 percent recommending it, according to Rotten Tomatoes. Box Office Pro was forecasting $10.4 million in weekend ticket sales.